Here’s a word that sounds like it’s plucked straight from science fiction: Paracosm. That’s the term used by psychiatrists to describe the act of creating imaginary worlds. A lot of us do it. We don’t just tell stories. We cook up whole make-believe realms in our heads. Dream worlds, alternate realities, imaginary places. Over the last several decades, these fictional elsewheres have become a bigger and bigger mainstay of popular culture, from Oz and Narnia to Middle Earth, Neverland and Westeros. One of the biggest and richest imaginary worlds, now shared by hundreds of millions of fans, is the entire galaxy “far, far away” that was invented by George Lucas in the 1970s. All these decades later, I can still remember vividly the sense I had as a 12-year-old boy watching the first Star Wars film. I grasped immediately that this was a place where my imagination could roam. The movie seemed to offer a small, tantalizing glimpse of a place that was vast and complex and exciting. On this eve of the new Star Wars movie, I don’t want to talk about Lucas’s creation as a cultural juggernaut, or as a series of (mostly disappointing) films. I want to reflect instead on the astonishing act of creative energy that first movie represented. In almost every scene, there were vivid characters doing thrilling things – perfect Saturday matinee fare. But you also had the sense that there was much more happening just off camera, just outside the frame. That was the nut of Lucas’s genius. He gave us just enough of a peek through the keyhole that we could roam the rest of his galaxy in our imaginations. Who was this incredibly wicked villain Darth Vader? Where did he come from? We also realized, to our delight, that Vader wasn’t the ultimate villain. There was even more in the shadows. Who was this Emperor who served as Vader’s puppet master? Even in the smallest details, Lucas and his crew left seeds of inspiration for the rest of us to cultivate. The spaceships look battered, run-down. Where had they been? Han Solo bragged about making “the Kessel Run.” Where did that go? And who was this Jabba character sending bounty hunters to gun Solo down? As a kid, before the second and third films came out, I explored all those places and possibilities with real joy in my own daydreams. Unfortunately, in the years that followed, Lucas felt called upon to fill in as many blanks as possible. Rather than opening new imaginary horizons, he kept trying to answer questions with finality, with a deadening kind of concreteness. Movie by movie, “fact” replaced wonder. Specificity replaced mystery. It turned out the Force wasn’t a mystical idea, a magical, unifying life force. Instead, it was the by-product of some kind of weird microscopic bacteria. The Empire wasn’t an all-powerful, ancient and overwhelming power. Instead it was the fairly recent product of political scheming and bureaucracy run amok. It felt more like modern Washington DC than some distant, wondrous realm. Lucas also decided the main characters in this story weren’t just fascinating, flawed people serving as our avatars in his world. They were, rather, messianic figures. They were exclusive, unique. In the first film, Luke Skywalker was a farm boy, the son of a dead knight trying to reclaim some small part of his family’s honor. Any kid could see himself in that role. But by the second film, Luke was part of a prophesied dynasty. Darth Vader was his father, Princess Leia was his sister. Movie by movie, the knots grew tighter. The more we learned, the smaller and more incestuous this galaxy became. Finally, and most painfully, Lucas fumbled the balance in his story between creating a coherent science fiction world and staging a spectacle that would appeal to children. It’s easy to see why. Children buy theater tickets and they buy toys. But the truth is that children went to see the first and second movies and bought lots of toys, despite the fact that the original two Star Wars films — the ones purists like me cling to — were pretty dark and complicated. They told stories about a wondrous but also a hardscrabble place, far more like Casablanca than Alice in Wonderland. And kids still loved it. I know I did. When that barkeep expressed racist ideas about robots (“We don’t serve their kind here”), we got what that meant. When Han Solo suckered a bounty hunter and shot him dead, we understood what that said about life in this imaginary place. It was gritty and dangerous. It came in shades of gray. That’s why the world needed real heroes. In the movies that followed, however, Lucas stopped trusting us. He didn’t think we could fill in the blanks or navigate the sharp corners. His Stormtroopers got dumber and dumber. The Ewoks and Gungans and poop jokes began to take over. Over time, the world of Star Wars seemed less like a coherent place we could visit in our imaginations and more like the setting for a Bob Hope and Bing Crosby road movie. It’s too bad. Other paracosmicists have had more luck. After writing The Lion, the Witch and the Wardrobe, CS Lewis set off to explore Narnia and the resulting books (including, gasp, a prequel) expanded our sense of wonder, opening door after door (call it wardrobe after wardrobe), and allowing us plenty of room to wander. After writing The Hobbit, JRR Tolkien spent decades fleshing out Middle Earth. The stories got bigger and scarier and richer, not smaller and sillier. Over the years, George RR Martin’s “Game of Thrones” novels have grown deeper, more byzantine and thorny, without ever seeming to close off avenues of imagination. When that cycle finally ends, I fully expect Martin to have the wisdom to leave lots of loose threads and gaps and blank spaces on the map. That is, after all, what makes an imaginary world live and breathe. Which brings me to my new hope (sorry) for the reboot of the Star Wars franchise hitting screens this week. Whatever else director JJ Abrams does, I want to come away from the theater feeling like I’m finally back in that imaginary place Lucas plucked from his imagination. I want the sense that for every action we see on the screen, there’s something else happening somewhere else that might have been just as interesting. That moment was a brilliant bit of storytelling. It told us huge amounts about Luke’s character, his youth, his lack of maturity, how much he needed to grow. But it also hinted at how much more was out there. It was a doorway to an entire, glittering galaxy, revealed in a single line of dialogue. Fingers crossed that this week we’ll all get to go there again. Comforting that in this time now, so very very close to home, each new major fantasy behemoth will bring a deeply thought commentary from O’B Mann Kenobi. I think I was 15 when my grandpa dropped me and 2 friends at the theater for the first Star Wars (I don’t care how you number the episodes, it was the first). I remember feeling exhilarated on the ride home, the tail lights of all the cars on the Northway morphing into resistance fighters ahead. Lucas quickly turned to the Dark Side making sales of toys and character figurines more important than imagination. But the Dark side was always in him, as he cobbled the whole story together from bits of imagination of greater Masters before him, most notably Kurosawa. This episode is a New Hope. But there are always new hopes. You nailed it perfectly. That is what killed SW for me. The first movie was perfect, engaging one’s imagination. Then, as you so eloquently stated, Lucas had to go an explain away all the mystery and magic. That killed the series as much as breaking open a snow globe to only to find mundane items like water and plastic than made up it’s charm. Lucas, you should have explained less, and shown more. 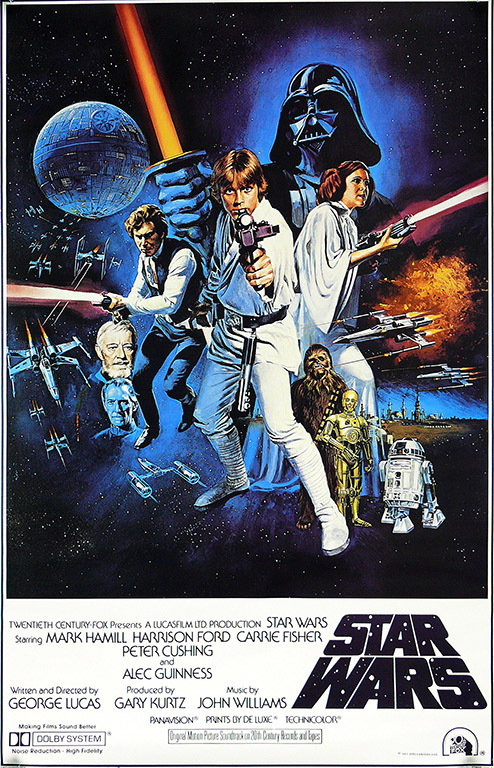 If you adjust for inflation Gone With the Wind is number one at the box office and the first Star Wars is second. Gone with the wind did it in 1939 (not even TV advertising). Amazing. They basically sold about 90 million tickets in a country that then had 130 million people. You pretty much nailed it, Brian (although for me the second movie -The Empire Strikes Back – was the best movie in the entire series -so far! I guess living in a northern climate I related very well to the ice world of Hoth). lucas invented nothing new. he re-purposed ancient ideas, myths and mixed in muppets in space. read Joseph Campbell’s take on the film. he peels back any “newness” about the storyline. paracosm smaricosm. mankind has been there, and done that. still, I appreciate the films with their warts and at face value. Well, sure. Mallory cribbed from the French myth-writers, Joyce cribbed from Homer, Shakespeare stole from everybody, Goethe ripped off a 15th century pamphlet and on and on. People who create alternate or imaginary worlds are never entirely original. If that’s disqualifying…well, you’ve got nothing. I saw the first Star Wars nine times. I wanted to be sure that I had seen the blooper when the Stormtrooper hits his head on the door being raised in the scene when they blow open the door and find R2 & C3PO in the closet. I expect I’ll see this Star Wars at least twice. Any opinions on 3D versus 2D? 2D, 3D? May depend on your age. Same with HD everything. I’ve seen several movies in 3D and have yet to find that 3D adds much to a movie experience. If it calls attention to itself then that becomes a distraction from the immersive quality of a good story — or maybe it has just been used as a crutch to distract from flaws in the story telling. On the other hand, I think younger people take it in stride and don’t pay so much attention to the tricks. Kids these days aren’t as sophisticated as we oldsters. And HD…yuck! Hard to pay attention to a story when all you can focus on is people’s pores or the makeup they use to cover up the pores. The test for 3D. Did you love that James Cameron movie (I can’t even remember the name of it) with the blue people? I barely remember seeing it. I enjoyed it at the time, like cotton candy at the county fair but what I really remember at the fair is the horse pulls or the smell of the barns, and I remember Star Wars. I haven’t been bothered seeing 3D since it was first used in the 50’s. Star Wars? I always thought it was okay but then I was an adult when I took my children to see it. Don’t care if I ever see the latest version. If I do, it will be when it ends up on HBO. I’ll take James Bond or Mission Impossible any day over Star Wars.